12/28/18 Addendum No. 1 modifies bid opening date and time to Tuesday, January 8, 2019 at 10 a.m.
PC-1704 6700 & 6800 BLOCKS OF WEST GRAND BLVD. PC-1705 6500 BLOCK OF WEST GRAND BLVD. 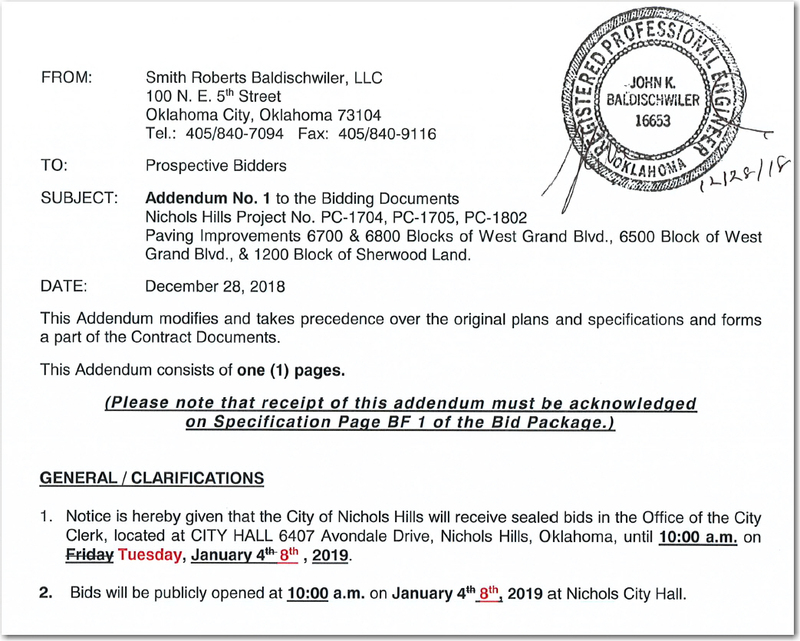 Bids will be publicly opened at 10:00 a.m. on January 4th, 2019 at Nichols City Hall. Bidders shall be pre-qualified in accordance with the Instructions to Bidders. Bids shall be made in accordance with the Notice to Bidders, Requirements for Bidders, Plans, Specifications, and Bidder's Proposal, which are on file and available for examination at the Office of the City Clerk in the Municipal Building and are made a part of this notice as fully set forth herein and copy of which may be obtained on a CD from Smith Roberts Baldischwiler, LLC, 100 N.E. 5th Street, Oklahoma City, Oklahoma 73104 upon a non-refundable payment of $10.00 per CD. All bids shall remain on file at least forty-eight (48) hours thereafter before a contract shall be made and entered into thereon. Dated this 12th day of December, 2018.